​Arsenal players have been filmed at a 'wild champagne and vodka party' that took place the week before the season, with Mesut Ozil, Alexandre Lacazette, Pierre-Emerick Aubameyang, Sead Kolasinac and Matteo Guendouzi all appearing to inhale 'hippy crack' from balloons. Video footage seems to show Ozil and the others collapsing onto sofas, apparently semi conscious or even unconscious, after inhaling the nitrous oxide. It is otherwise known as laughing gas, which in the worst cases can cause death through suffocation. 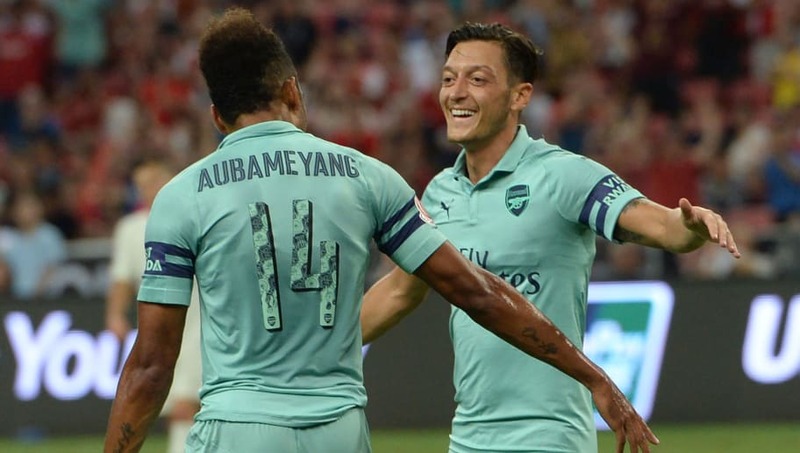 The video has been obtained and shared by The Sun, with claims that the Gunners star racked up a bar bill of £25,000 to £30,000 at the private party, held at a club in London's West End in early August. It is said that around 70 girls were specifically invited to attend. "Boxes of 'hippy crack' canisters were brought in and the players were blowing up balloons and inhaling. They were off their heads on the gas - some of them appeared to pass out. It got pretty wild," one 'source' told the tabloid newspaper. "Ozil looked out of it at one point. He took a big draw on a balloon then seemed to lose consciousness and slide down in his seat. "The young player with the curly hair [Guendouzi] was also encouraged to have a go and the effect was even worse. He inhaled the gas then passed out completely and slumped to one side on a sofa." At that time, 19-year-old Guendouzi had only just joined the club from Lorient and would make a surprise Premier League debut the following week as Arsenal were beaten by reigning champions Manchester City in their 2018/19 opener. The source continued: "It was incredible to see so-called athletes and role models taking risks with a dangerous substance. If their fans - and their coach - could have seen what was going on they'd have been horrified. It got more raucous as the drink flowed. Several left with girls in black Mercedes people carriers as it wound up at around 4am." What do you make of the Arsenal footballers who were filmed drinking and inhaling the so-called hippy crack nitrous oxide? They were at a private party, they're adults and what they were doing is not illegal. Does it matter that thousands of kids look up to them as role models? Henrikh Mkhitaryan and Shkodran Mustafi also appear in the video footage, although neither is seen inhaling gas from the balloons. While previously a 'legal high', nitrous oxide was covered by the 2016 Psychoactive Substance Ban, with the Home Office declaring after a review in 2017 that the gas remains 'illegal to supply for its psychoactive effect'. There is, however, no penalty for possession.